I recently had a lovely little break in my old city, Durban. 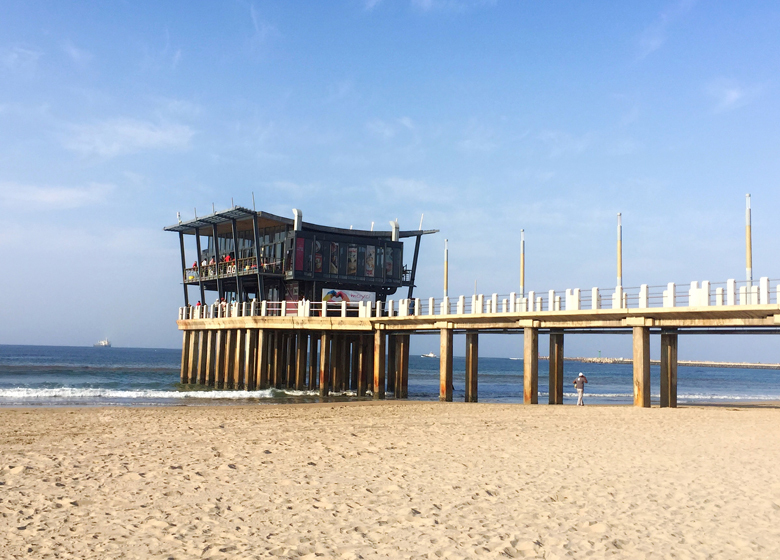 While I was there, soaking in the winter sunshine – (yep, like true Joburger’s we spent most of our time at the beach – in winter noggal) – it reminded me of how amazing Durbs is. Having lived there for 10 years as a local, I had forgotten what made Durban such a gem! Granted, when you live somewhere, going on holiday to the same place is a totally different experience. So, it was nice to Do Durban firstly as an adult (without parents on holiday, where you can do your own thing) and secondly as a holiday maker with nothing on the agenda. Of course! Durban has the best beaches in South Africa, and I’m not just saying that because I used to live there! While I wont deny that Cape Town has beautiful beaches, the freezing Atlantic Ocean on that side of the country (plus the wind almost all the dang time) kinda puts me off going to the beach in Cape Town. 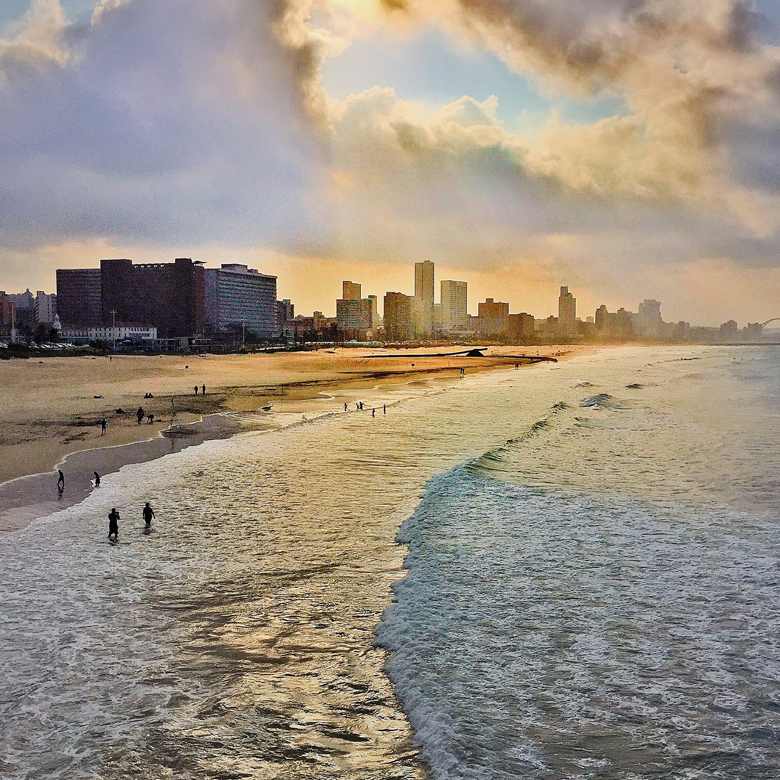 In Durban however, you can enjoy the glorious (and warm) Indian Ocean waters, sit on the sand, soak up the sun and watch the surfers do their thing. Just before I left Durban, was it three? possibly around four years ago? they had already done quite a lot of work on the beachfront promenade. They had accomplished quite a bit actually, but I was too busy packing up my home and moving to go and enjoy it. This time however, it was top of my list! I’ve always loved Durban Main Beach. 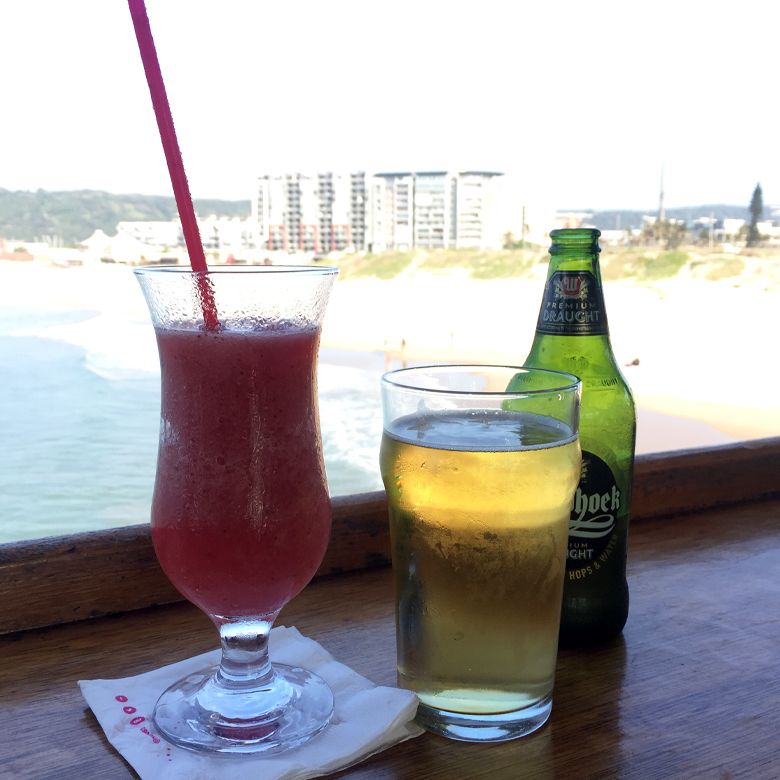 We used to spend our time at Pirates Beach and Suncoast Beach, but in the later parts of our time in Durban, we had really fallen for Ushaka Beach. I don’t know what it is about Ushaka Beach, it’s just got that vibe and while there are many holidaymakers, it was (and I think it still is) very much a local’s beach! I love that it is clean, that it felt safe-ish (with a definite policing force), that there is loads of space to sit and that there is life (yet it’s not so commercially littered). So if you want a quick bite, it’s right there (btw Wahooz does take away or eat in burgers and toasties that are yum) and you can enjoy the beating African drums coming out from Moyo on the Pier. I’ve never been to Miami, but I would imagine Ushaka Beach and it’s surroundings to be the South African beach singing along to Will Smith Lyric’s and saying Buenvenidos a Miami. Ok, I’m going to let you in on a little secret! My absolute favourite spot in Durban – always has and probably always will be – is the view of the Durban City skyline and the epic Moses Mabhida stadium from the edge of the Pier at Moyo. There is nothing quite like this view, anywhere out there! Sand, sea, city skapes and sunsets. It’s amazing – trust me! Perhaps, this shot is just missing the surfers – but you can’t have it all, now can you? And plus, they are on the other side, but let’s just go with it ok!? I caught this shot as the sun was going down and was really lucky to capture those final rays of the sun piercing through the clouds. It’s one of my favourite views and my favourite photos. In the summer, after the rain clears the atmosphere, this view is equally as amazing, with a clear and magnificent view of the buildings and stadium. While you’re waiting for sun to set, Cocktails in what feels like the middle of the sea – at Moyo on the Pier – is a great way to end the day! The atmosphere is chilled and vibey and depending on which side you sit, you get a completely different vibe. On the left (which is the side of the epic view shot above), you can watch the swimmers on the main beach, or take in that unforgettable skyline, and on the right (where this shot was taken), is where the surfers hang out. You can order drinks and delicious snack baskets, sit inside or on the balcony. It’s such a fab spot and I really love it when they start beating those African drums, which you can hear all the way on the beach as well! I’m also happy to report, that their Daiquiris are STILL pretty incredible! 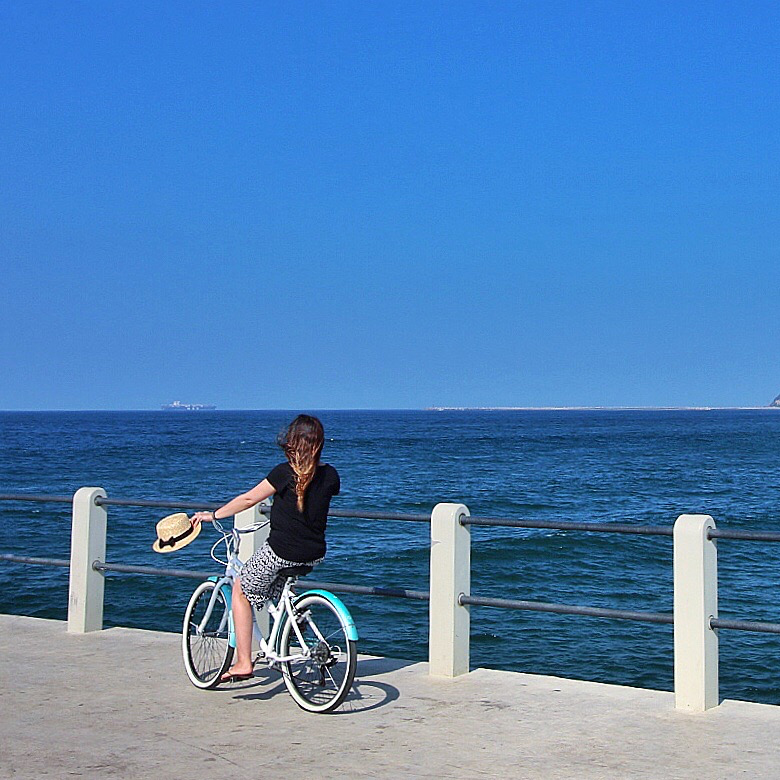 If I still lived in Durbs, I’d totally invest in a Cruiser Bike and take it to the beach every day. They are awesome! 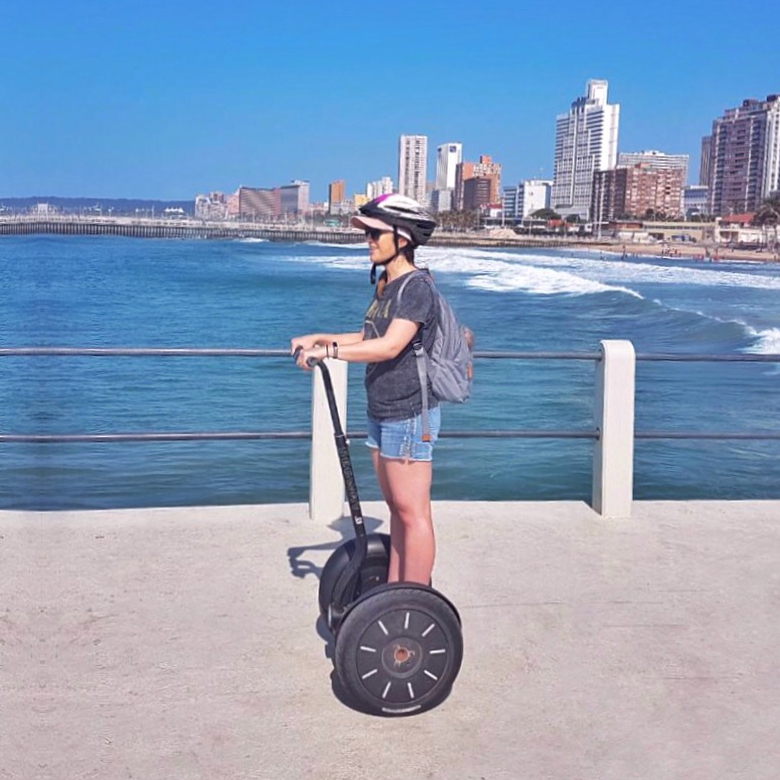 And riding them up and down the beachfront promenade is a great way to enjoy Durban. You can hire them from vendors all along the strip – mine was R70 for an hour and I got it from the little beach hire shop at the entrance of Ushaka. Such a bargain, although, granted an hour was probably not enough time. We cycled down the promenade, all the way to the Stadium (which is where my featured image was shot) and along the Pier. It did get quite windy as we cycled on the Pier, so just watch your hat! 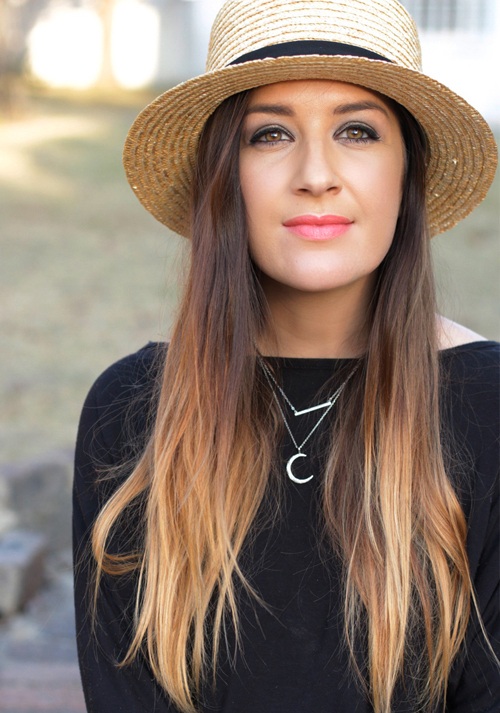 Another piece of advice, which I will use on my next trip as well, is dress the part! Our cycle adventure was a last minute, “hey, lets do this”, so I was cycling in my maxi skirt, which I had to hike up so I could use the pedals. Nice one DIMI! The nice thing about the bike rental is that you can go out on your own without a guide and explore! Now this was epic! In so, so, sooooo many ways! It was truly awesome, exhilarating, scary and yes, I was the dork who almost lost my marbles, 30 minutes into the ride! HAH! Just remember, lean back… easier said than done, especially when the wind is pushing you forward, but alas, lots of fun was had! For this tour we went on a 1 hour ride, although I think 30 minutes might have been more than enough for me! We wheeled our way down the promenade, dodging through the walkers, skaters, riders and dogs, all the way up to the Stadium. It was actually on the downhill into the stadium complex that the Segway and Wind decided to work together and give me the fright of my freaking life! Just picture little old me, with my chest pushing forward, arms pushed back like a little chicken and screaming like a little girl! Thankfully, my husband, the little Segway superstar, and our guide (the champ) were there to remind me, leaning back didn’t mean sticking my bum out, it meant, leaning my whole body back! Lesson learnt – thanks guys! This was however great fun, and yes, I would absolutely do it again! I’ve done a Segway tour before, but it was an off-road one, and very different! I think the fear of falling on nice hard concrete far surpassed the fear of falling in the comforting gardens of Sun City! The Segway’s were a little more than the Bike hire, and if I remember correctly, an hour was R220 per person. Hired from the same place as we did the bikes. 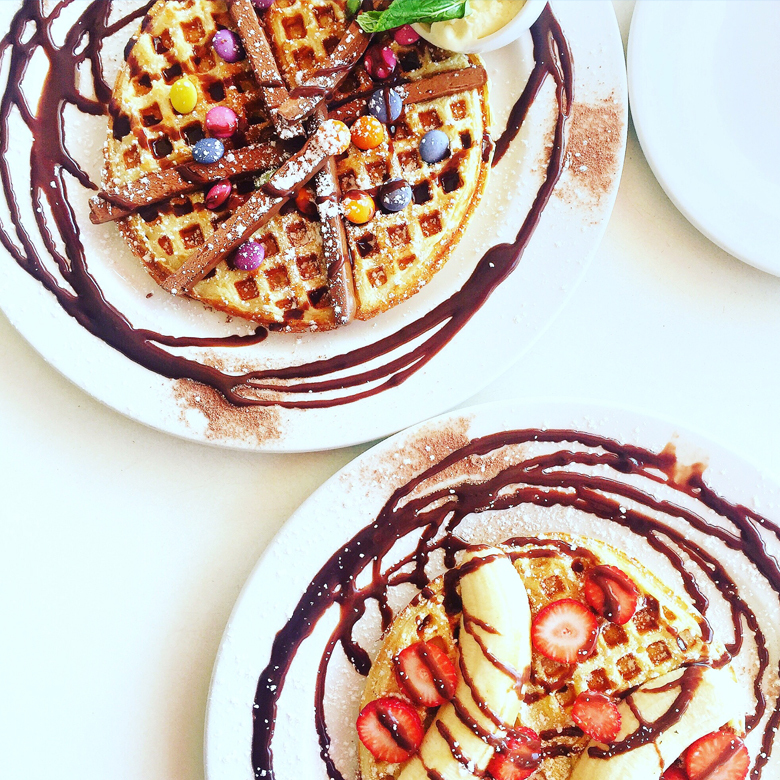 The waffles at Piatto Ushaka were ahhhhhhha-mazing! I mean look at that presentation! KILLER! Mine was the banana split and hubby’s was loaded with Bar One and Smarties. Delicious, delicious, delicious! They weren’t overly big in size, although I do think the gigantic plates made them look smaller, but they were just the right amount of yumminess, that you don’t feel sickly after all that sugar! I could really do with one right now! I do think that we made Durbs just in time to enjoy the “best season”. IMO at least! When we lived there, I always remember Durban’s “winter” to be in September, October and November. Not that it’s cold or anything like that, it’s just that time of year is generally wet, windy and mizzy. Jozi definitely has a better Spring season, although Durban is an absolute GEM in winter. June, July and August are the best! Of course, summer time is also fantabulous in Durban, but it’s hot, it’s sticky and it’s chaos with the amount of dang Joburger’s in town! What’s your favourite part of Durban?